Kirkland Air Conditioning & Heating provides homeowners across Charlotte Metro Region with a reliable source of temperature control. We combine quality products, skilled workmanship, and conscientious service to deliver ideal comfort without straining your budget. Whether you’re in need of new installation, system replacement, proactive maintenance, or prompt repair, our NATE-certified professionals are always available, 24 hours a day, 365 days a year. 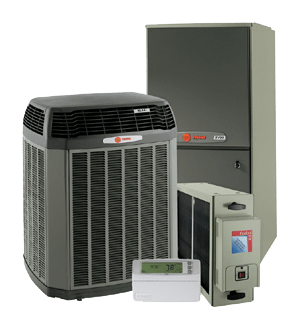 We work on all makes and models, and specialize in Trane and Mitsubishi heating and cooling equipment, protecting you with proven performance, leading-edge technology, and outstanding warranties. Mitsubishi Electric cooling and heating equipment is available from qualified contractors who have completed comprehensive installation and service training. As your local Mitsubishi Diamond Contractor, Kirkland Air Conditioning & Heating is knowledgeable in every aspect and feature of the full product line, and capable of matching your precise needs to the perfect solution. For installation, service, and repair, we adhere to strict procedures, resulting in superior operation over the life of your system. Through our industry affiliation with Trane, we bring our customers a wide range of state-of-the-art heating and cooling systems that combine durability with efficiency. From economical temperature control, to innovative features, Trane has it all. The team from Kirkland Air Conditioning & Heating works closely with you to determine the right solution to your retrofit, replacement, or new installation project. We have rebates available! Limited time offers! Call Kirkland Air Conditioning & Heating for heating and air conditioning repairs, service, and installations! Established in 1986, Kirkland Air Conditioning & Heating has an established history of customer satisfaction. We are experienced in the unique challenges of local weather, and have tailored our recommendations and services to deliver lasting rewards. We employ a team of fully licensed, insured, and highly trained technicians, equipped with the latest technology, to answer any challenge accurately, swiftly, and professionally. Know that every job is handled with care. We leave no mess or damage behind, never waste your time with delays or tardiness, and always prioritize your best interests. For perfect comfort, greater convenience, and affordable service, homeowners across Huntersville, Cornelius, Davidson, Pineville, Matthews, Weddington, Indian Trail, Stallings, Mint Hill, Wesley Chapel, South Park, Ballantyne, Highland Creek, Harrisburg & Waxhaw put their trust in Kirkland Air Conditioning & Heating.